_ CREDIT SUPPORT FOR WOMEN! 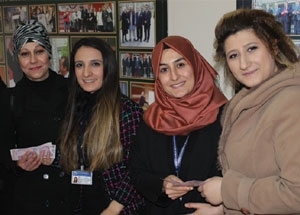 Mikrokredi Branch, operating within the Turkish Foundation for Waste Reduction, provides credit support to women who want to start new business and improve their business in our city. 300 female applicants for the loan together with the new year, while the micro-credit branch since 2012, operating 700 women, as of today, a total of 1 million 540 thousand 850 pounds credit support was provided. Especially, ladies who work at home show great interest in the loans given in order to make income at home, while ladies who want to trade on hairdressers, tailors, cosmetics and home meals can benefit from the loans. 5'er person and a thousand liras starting at the rate, according to performance can go up to 10 thousand liras. While there is no interest in the system, the service cost is cut off. Payments were made in weekly installments, while many women who applied today received loans. On the other hand, the executives of the Sakarya Branch of the Turkish Foundation for the Prevention of Waste Reduction, Ecem Kaçanlar and Zahaogül Bakan Ertop loaned the field officer.